An exciting and unnerving ride this past week as the Chinese market fell 8% on Monday and finished out the week about 10% down (Guardian here and analysis here). If trading had not been halted in a number of companies, the damage could have been much worse. In the past year the Shanghai Composite has shot up 150% as individual investors piled into the market with both their own savings and borrowed money. Despite the loss of 14% for the entire month of July, investors in the Shanghai index are still up 13% for the year. Let’s turn to the U.S. where the SP500 index has gained 6% since the downturn in October 2014. Below is a chart of SPY, an ETF that tracks the SP500 index. MACD is a common technical indicator that follows market trends. The most common setting is to compare 12-day and 26-day price averages (the MA in MACD) and measure the convergence and divergence (the C and D in MACD) Comparisons of longer time periods can clarify overall trends in sideways markets like we have experienced this year. The chart below compares the 30-day and 72-day averages (blue line). The red line is a signal line, a 15-day average of the blue line. The market seems to be at the end of a mildly positive cycle that has been in place for nine months. We may see a renewed move upwards but the near zero reading of the past few weeks indicates the uncertainty in the market. Earlier this year, the price of long term bonds went down (yields went up) in anticipation of rate increases from the Federal Reserve. 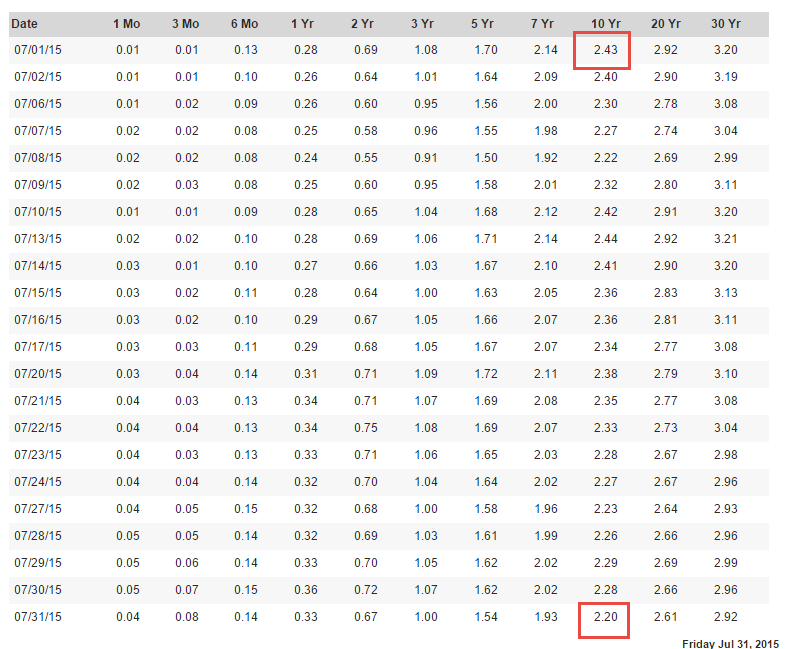 Counteracting that trend in the past month, long-term bond yields have gone down (U.S. Treasury) as investors bid up treasuries in the hopes that the Fed will delay raising rates till after September. 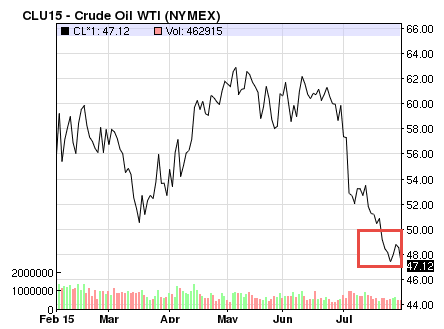 On July 22, the price of of a barrel of West Texas Intermediate (WTI) oil broke below $50 (NYMEX). Two previous times this year the price has come close to the psychologically important $50 mark only to rise back up. Now traders are concerned that the U.S. Energy Information Administration’s (EIA) short term estimates of oil reserves and rig counts may not be accurate. “When in doubt, get out” has been a recent refrain. Let’s go up in our time balloon to see why the breaking of this price point has some traders worried. 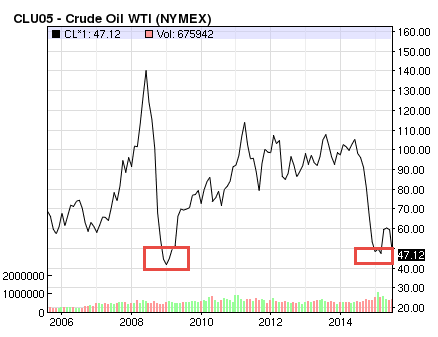 The last time WTI broke $50 was in the 2008 meltdown. China’s growth is slowing. Europe is idling in neutral. Forecasts for global economic growth are subdued = low demand and this is why commodity prices are at ten year lows. Positive economic growth in the U.S. may be the only bright spot in this global forecast.